Sports fan Generette shared his latest basketball illustration of Kevin Durant with Apple, said to celebrate the player's return to the Golden State Warriors in time for the 2017 NBA playoffs, as well as the team achieving its best regular season record. 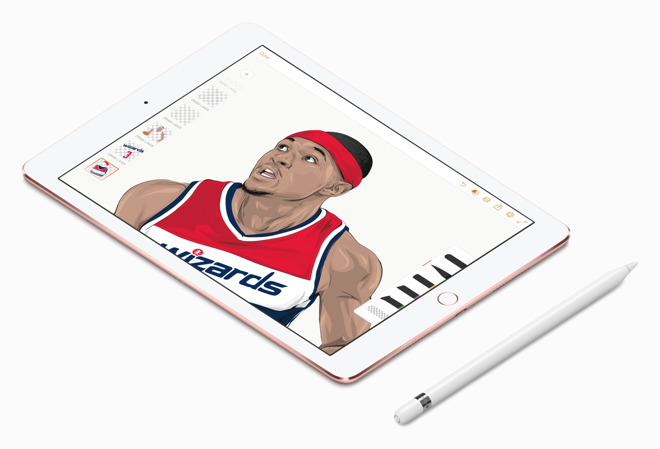 Generette, an art teacher as well as a sports fan, says he uses a combination of the iPad Pro, the Apple Pencil, and Adobe Illustrator Draw to create its work, described in a Mashable profile in February as "bright, arresting sports imagery." His work mostly takes place on the 12.9-inch iPad Pro, which he uses to show both the drawing app and the reference photo, with each piece taking between two and five hours to produce. Originally Generette started drawing digitally with a MacBook Pro in Adobe Illustrator, before moving to the original iPad, later aided with a Wacom Bamboo stylus. Initial iPad illustrations were drawn in Sketchbook Pro, though soon started using Adobe Vector, which is now known as Adobe Illustrator Draw. One other element of Rob Zilla's workflow is his iPad stand, with the Kolibri from Cremacaffe Design appearing prominently in Apple's photograph of the artist. 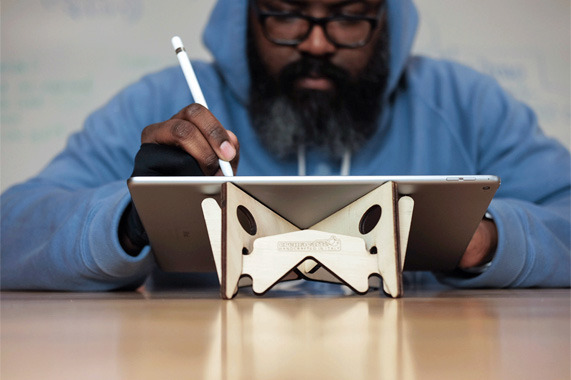 Billed as an all-in-one laptop and tablet stand and made in Italy, the Kolibri allows for the iPad to be held in one of four different positions, including angles best suited for writing and drawing. As part of the Golden State Warriors' regular Warriors Fan Night this evening, the team will be featuring Rob Zilla's illustrations, including players, legends, coaches, and fans during halftime, all designed on the iPad Pro. Others are also taking interest in Rob Zilla's work, with the Washington Wizards commissioning the artist to create portraits and murals of their own players.